Katie is a raw natural powerlifter, figure competitor, and online coach from Columbus, Ohio. In addition to training clients online she does powerlifting coaching and seminars around the world. Note from Matt: This interview recorded from a phone call and then transcribed by me. Some portions may be edited slightly for an easier read. Matt: When did you first get involved with sports and fitness? Katie: Fitness has been a part of my life as long as I can remember. My parents and brothers were all involved with athletics so I grew up going to all of their sporting events. I always had the desire to be an athlete just like them. I participated in sports as a young kid and when I started high school I followed one of my brothers by choosing to do track. He did very well in track which was inspiring to me. I ended up becoming a very serious runner in high school and planned on doing the sport in college as well. Unfortunately, towards the end of high school I suffered a serious injury and had a virus at the same time. It pretty much derailed my chances of running in college. The timing of my injury and illness was unfortunate in terms of getting recruited (your junior and senior year are very important for running recruitment). Due to my injury and illness all I could do at the time was lift weights and as I kept at it I started to fall in love with it. I started to see some results in the gym and decided to not run in college. Even with the injury I had a scholarship offer to run in college, but I had found something I loved even more so I moved on. Matt: Looking back, what challenges did you have with weightlifting and your fitness after you made the transition from running? Katie: I’ve definitely had a few challenges. It hasn’t been a smooth ride the whole way. I think challenges in life are what make it interesting and without the lows you can’t really appreciate the highs. Throughout my transition, from running to weightlifting, I always had this idea that I had to be thin and light. It was a belief that was carried over from running. I thought that the slimmer I was the faster I would run. I think that it’s common for many women in athletics to have body image issues and disordered eating. It affects your confidence and many other areas of your life. You need to love yourself first before you can help others, you know? So, that was something I struggled with as I transitioned into weightlifted. I struggled with seeing the scale go up, with eating, and really struggled with properly fueling my body until I found out about macros and the flexible dieting approach to nutrition. For a few years I tried to eat as little as I could and do a lot of cardio in addition to lifting weights. It was tough to find a balance. Once I started to really focus on consistency I started to see results and breakthrough these vicious cycles I had put myself through. Along with that, it really is a struggle to push yourself in the weight room and test your physical limits, but that’s the part of this process I’ve always enjoyed. It’s definitely rewarding when you start to see progress in the gym from your consistency. Going to the gym and pushing yourself really builds mental fortitude over time. Eventually you start doing things that you never thought you’d be able to do and that confidence grows. It helps you in other areas of your life and that’s what it did for me. Matt: As you started to get more consistent with training for figure and powerlifting were there any influences that helped to make things click? Communities, trainers, or certain gyms? Katie: Definitely. So I focused on bodybuilding style programs for about four years before I did any sort of powerlifting. When I first started bodybuilding I was told that I shouldn’t lift heavy, especially for legs because my legs were already pretty big (relatively) due to running. I just kept it to light squats, running backwards on the treadmill, and other fluffy stuff (laughing). I was lucky enough to have exposure to an amazing figure competitor, Latisha Wilder, that competed at Arnold as my track coach in middle school. I watched her compete and said that I wanted to compete at Arnold someday as well. So, because of Latisha I always had figure aspirations but I went about it all the wrong ways at first. I had no idea what I was doing. Someone who was instrumental in encouraging me to lift heavier was the owner of Beyond Limits Training Rich Lauro. He told me that it wasn’t going to make me bulky, especially since I was a natural female. Rich, a natural bodybuilder himself, just kept on telling me that I needed to tap into my potential as a lifter. After that I started to work with Layne Norton and he, along with Mike Zourdos, encouraged me to start powerlifting while I was prepping for my first figure show. It was refreshing to be exposed to these coaches and communities who were evidenced-based and way past all the bodybuilding fads that I’d seen before. These coaches and my friends at Beyond Limits really helped me make a lot of progress as I started to apply this advice to my training. Matt: So you finally started to compete in figure and powerlifting. What was the drive behind that and what were your early days like competing in this new sport? Katie: As I continued to lift heavier with the intention of competing in figure I fell more and more in love with the process of building muscle. Looking strong and healthy was very attractive and beautiful to me. I ended up diving into competing at figure and powerlifting events at the same time. My first figure show was one week after my first powerlifting competition which, in hindsight, was pretty awesome that I had the opportunity to do that. It demonstrated to me that you can still lift heavy and shape a physique. I still do a hybrid bodybuilding and powerlifting approach with my training. A lot of people think if you do one than you have to abandon one or the other and it’s not true. If you follow a moderate diet and aren’t doing anything extreme you can gain strength during a cut. You just have to be very consistent. Typically you lose some strength, but you can still maintain. During my first prep I actually gained strength even though I lost 20 pounds. The goals aren’t mutually exclusive. So, I’ve enjoyed the process of going back and forth from one sport which is more subjective and the other where you just lift the weight you lift. For powerlifting, in particular, the focus on performance is something that I love as an athlete. Matt: You began to have some success with competing and around the same time started to build an online presence. Can you tell me how this started? When did you start to take this more seriously? Katie: It kind of just grew organically. I did start to have some success and won my pro card in figure. I think it was a bit unusual to see a female compete in both sports at the same time. I had so many people reach out to me who thought it was really cool. I’ve been doing this for so long that I take it for granted now, but for women there are still a lot of stereotypes and misbeliefs to overcome. Women will look manly if they lift heavy and so on. It’s a real pleasure to show that you can look good, be strong, and just be healthy. If you take care of yourself and are working hard I think that extends into other aspects of your life. So, I think that was sort of a message that I was putting out organically which resonated with a lot of people. It’s awesome to be able to have this platform and demonstrate you can be healthy with competing in figure and powerlifting. There’s a lot of outdated misinformation out there. I hope that more people become aware that you can do this naturally and enjoy the process. That’s always a message I want to get across to people. Matt: Eventually you started to turn this into your career. What type of coaching are you doing now and what else do you offer as a fitness professional? Katie: The majority of coaching that I do is online, but I also train in-person at Beyond Limits Training. Mostly powerlifting instruction. I also do powerlifting seminars and have done quite a few this year. I’ve done them with fitness professional friends, worked at a few of Layne Norton’s camps, and done a few on my own. The latest seminar was in Salt Lake City in July. It’s been really cool to meet people at the seminars who I have previously only communicated with online and are interested in meeting me. I’ve built a lot of great friendships through these events. Matt: When you started to train others, instead of just training yourself, what challenges did you run into? Katie: There are a lot of challenges. The first one that I noticed was communication. A lot of times you can be a very good athlete, but if you can’t communicate effectively to others and be patient it’s never going to work out. You can motivate yourself, but that’s completely different than motivating others. When I first started online coaching I already had experience with coaching in-person and at seminars, exposure to great coaches in the industry, and my own experience. However, there was still a lot for me to learn. I’m always trying to improve in learning more about the different ways to coach people and find out how different people respond to certain types of feedback and critique. Video is an extremely important for powerlifting medium for me and it’s a huge part of what I do as an online coach. My clients can send me a quick 15 second video of their lift and I can give a very detailed response which is awesome. I’ve really enjoyed the learning process and building relationships with my clients. It’s not just writing a program and giving it to someone. There’s feedback and discussion with each client every week. So much of the training and nutrition for bodybuilding or powerlifting is mental and having someone in your corner who can give you an objective view really helps. A lot of times I feel more of a psychologist than a coach (laughing). I’m very lucky that I have the experience to empathize with a lot of my clients as they start their fitness journeys or transition into taking them more seriously. I’ve had my own struggles so it helps for me to relate and understand where they are at so I can help them come out on the other side. It’s a very rewarding process to go through. Matt: For the fitness professionals reading this, do you have any advice on building an online presence? Katie: I think being genuine is the most important thing. You shouldn’t look at what someone else is doing and try to copy it. You have to find what is unique about yourself and share that. A lot of times I’ve seen fitness professionals who put out information and content which all feels like an advertisement as opposed to sharing their story. People want to see how you’re doing this all in your own life. They want to see challenges and they want to feel hope. They want to see authenticity. The content you put out should help introduce you to your audience and build a relationship with them. Another thing is that if you have content don’t be afraid to put it out there. That was huge for me. If I want to share something I won’t hesitate anymore. Someone out there will relate to your content and that’s a wonderful thing to experience. Matt: So online training has been around for a while in the bodybuilding and powerlifting communities, but for the rest of the fitness world it’s still a nascent training service. What do you think about the online coaching industry as a whole right now and the direction it’s headed? Katie: The online fitness community has been great for me personally. The majority of my business is online. As an entrepreneur with a business background it’s amazing to see people get exposed to quality content and coaching that they never would have seen otherwise. It’s really cool to see the success that online coaches are starting to have and the results of their clients. I think that the potential for the industry and for coaching platforms like StrengthPortal is unlimited. As all these platforms advance the communication between coach and client is going to get even better. The ability to use video as a part of this is huge and really helps build the relationship between the two parties when coaching remotely. One aspect of this type of training is that with online coaching I can communicate with my clients every single day when compared to in-person training you may only see the client 2-3x a week. I think a lot of times coaches that have only done in-person training are wary of online because they aren’t sure how to build a relationship through these mediums. Through online coaching you can potentially give quicker and more consistent feedback if you set up your systems and tools the right way. So, I’m excited to watch this type of coaching continue to grow and improve. Matt: What are you excited about for you over the next 3-6 months? As an extension of that, beyond online coaching, what are you excited about for the fitness industry as a whole? 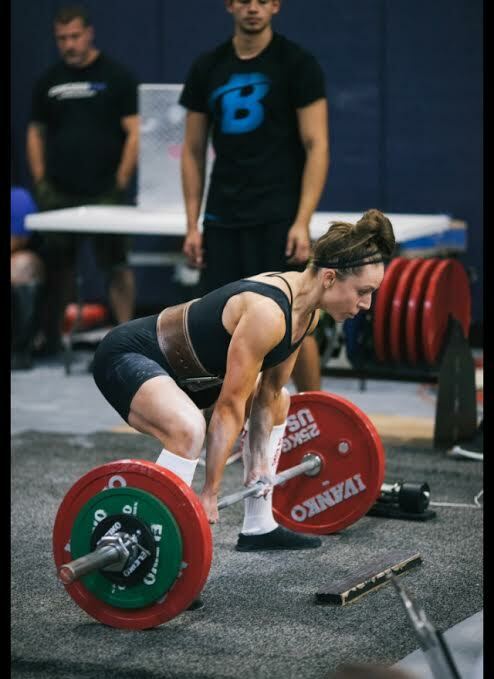 Katie: Personally I’m very excited for Raw Nationals coming up for powerlifting in about eight weeks which will be a lot of fun. I’m not only excited to compete but also to see a lot of online friends in the space who I’ve never met in person. I’m looking forward to working hard every day and seeing how it ends up. I’m also looking forward to traveling for a few seminars the rest of this year. I actually have one planned to go to Australia this winter, which is big for me. On the coaching side, I have a lot of clients with competitions coming up. As a coach this is very exciting for me because this is the first year I’ve had the entire year to build up to these events with my clients. It takes time build up their strength or physique, so I can’t wait to see my long-term clients (who have worked with me for over a year now) compete. It’s really cool for me to see their goals come to fruition. Beyond that I just want to continue to help my clients improve and grow my business through their success. I want to build up slowly and make sure I don’t take on too much. I’m very blessed to have this opportunity so I want to make sure I put my best effort into it. Having a business like this wouldn’t have been possible 10-15 years ago. One other project that I’m excited about is a program I’m launching with Chris and Eric of Dynamic Duo Training. We’re going to release a 10 week program sometime this Fall. It will be a hybrid training program for strength and aesthetics similar to what I like to do in my own training. There will be support groups and video resources available which is going to be a lot of fun. For the fitness community, the thing I value the most are the people I’ve met and the relationships I’ve been able to build. I’m excited to do more of this myself and see the market expand as other fitness communities continue to grow. All of this started online for me, but I’m excited to see these relationships extend into the real world as well.